Berliner from CSSIgniter is a music WordPress theme named after “Berlin – Capital of Germany”, it’s truly responsive. Berliner theme is best WordPress template for artists, musicians, DJ party, Nightclubs and music industry people who are searching for the theme to crate true online identity through a their own website. The theme supports WordPress versions 2.3+ to all latest versions, future support is also guaranteed by releasing free updates. After you purchase this music theme you are entitled to receive free help and support for the lifetime. The theme begins it’s homepage journey with creative design to display everything or anything. 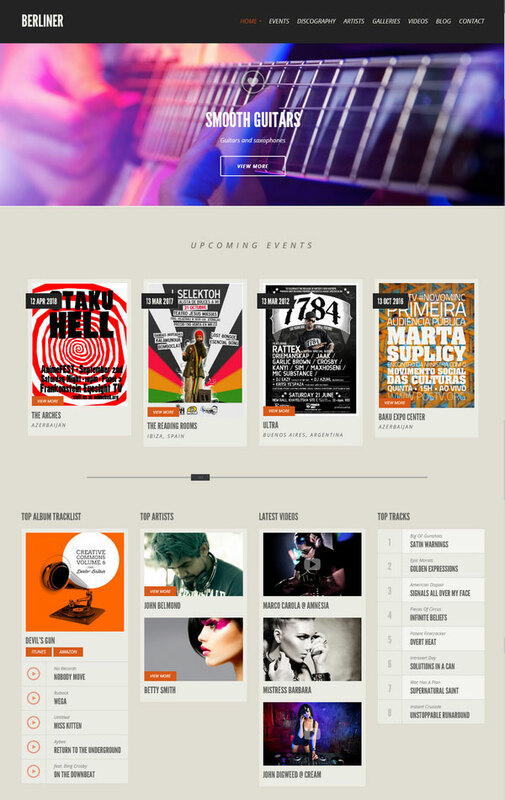 Some of the key features of the theme include: a mobile friendly responsive design, custom audio player with SoundCloud support, gigs and events, post types for artists, discography, alumbs, video, and photo galleries, theme options panel, shortcodes, HTML5 / CSS3 code, localization options and more.